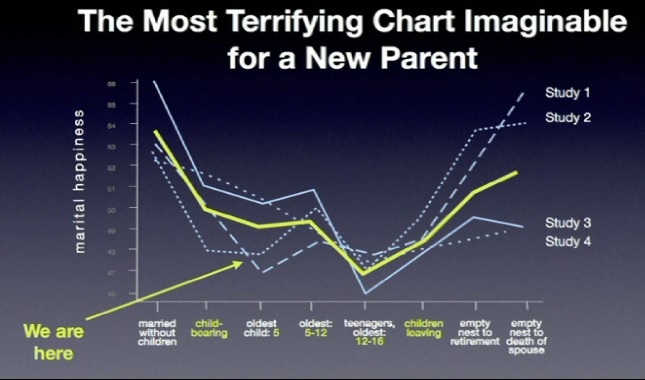 I wrote a TED Talk transcript of Parenting Taboos previously. Parents Rufus Griscom and Alisa Volkman (I guess she didn’t take his last name–maybe that’s another taboo) gave an interesting TED Talk (episode 3 available on Netflix.) In part 1, they gave 2 parenting taboos. Taboo #1: You can’t say you didn’t fall in love with your baby in the very first minute. Here is part 2 of the transcript, and we pick up on Taboo #3.
but today I’ll talk about mine. So after we had Decklin, we kind of re-calibrated our expectations. We thought we actually could go through this again, and thought we knew what we’d be up against. We were grateful that I was able to get pregnant and soon learned that we were having a boy. Then when I was 5 months, we learned we had lost our child. This is actually the last little image we have of him. It was obviously a very difficult time, really painful. As I was working though that mourning process, I was amazed that I didn’t want to see anybody, I really wanted to crawl into a hole. I didn’t really know how I was going to work my way back into my surrounding community. I realized the reason I was feeling that way is on a really deep gut level, I was feeling a lot of shame, and embarrassed frankly, that in some respects I had kind of failed at delivering what I’m genetically engineered to do. Of course it made me question if I wasn’t able to have another child, what would that mean for my marriage, and just me as a woman. A very difficult time. As I started working through it more, sort of kind of climbing out of that hole and sort of talking with other people, I was really amazed by all the stories that started flooding in. People that I interacted with daily, worked with, was friends with, family members that I had known a long time had never shared with me their own stories, and I just remember feeling all these stories come out of the woodwork. I felt like I happened upon this secret society of women, that I now was a part of, which was reassuring and also really concerning. The party line is that every single aspect of my life has gotten dramatically better, ever since I participated in the miracle that is childbirth and family. I’ll never forget, I remember vividly the day our first son Decklin was 9 months old, and I was sitting there on the couch and I was reading Daniel Gilbert’s wonderful book, Stumbling on Happiness, and I got about two-thirds of the way through and there was a chart on the right-hand side, on the right-hand page that we’ve labeled here, The Most Terrifying Chart Imaginable for a New Parent. This chart is composed of four completely different independent studies. 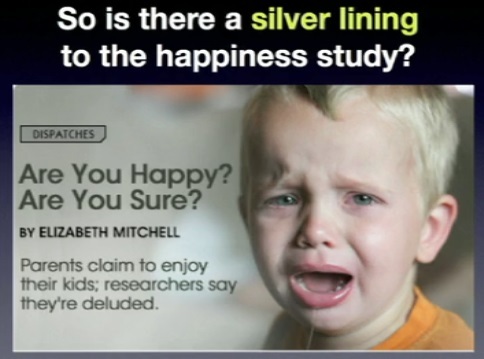 Basically there is this precipitous drop of marital satisfaction, which is closely aligned we know with broader happiness that doesn’t rise again until your first child goes to college! So I’m sitting here looking at the next two decades of my life, this chasm of happiness that we’re driving our convertible straight into. We were despondent. Sure enough Liz Mitchell did a wonderful job with this piece. She interviewed the four scientists, and she also interviewed Daniel Gilbert and we did indeed find a silver lining. This is our kind of guess this baseline of average arguable looks like throughout life. But average happiness is of course inadequate because it doesn’t speak to the moment by moment experience. So this is what we think it looks like when you layer in the moment to moment experience. (audience laughs). Rufus, “So in effect, we trade average happiness, we trade sort of security and safety of a certain level of contentment for these transcendent moments. So where does that leave the two of us as a family with our three little boys in the thick of all this? There’s another factor in our case. We have violated yet another taboo in our own lives, and this is a bonus taboo. Rufus, “BONUS taboo #5: You shouldn’t work together. We obviously we forwards with what we did, raised the money and we’re thrilled that we did because this phase in one’s life, the incredibly scarce resource is time, and if you’re really passionate at what you do every day which we are, and you are also passionate about your relationship, this is the only way we know how to do it. Rufus, “So this is what we think that a lot of parents when you get in there, in our case anyway, you pack your bags for a trip to Europe, and you’re really excited. You get out of the airplane, it turns out you’re trekking in Nepal, and trekking in Nepal is an extraordinary experience, particularly if you pack your bags properly and you know what you’re getting in for and you’re psyched.